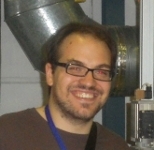 I am a technical student in PH-SFT group at CERN and MSc student in High Energy Physics at the University of Pisa. I am currently working on the development of a real-time software Level 0 trigger using multicore CPUs, accelerators and high performance networks for the NA62 experiment at CERN. Since 2010 I have worked with CERN openlab on parallelization of RooFit and on numerical accuracy of Minuit. I have good experience with: C, C++, Python, Perl and bash scripting. Parallel extensions: OpenMP, CUDA, OpenCL, TBB, pThreads, MPI.